Thanks for logging in to read my blog! I hope to journal some of the adventures I've got planned for this summer, most of which are related to learning to train my Border Collies as working sheepdogs, my efforts to become a better handler, and perhaps the occasional sheepdog trial. 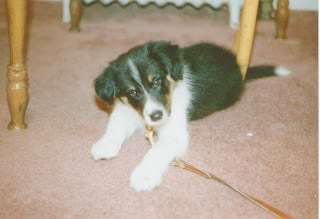 My journey as a sheepdogger began with Kaylie, my first Border Collie. She was a fantastic dog in many ways, and I consider myself very fortunate to have had her. Kaylie was of nice working breeding; for those of you readers who, like me, are always curious about how dogs are bred, her sire was Walt Jagger's Imp. Celt, and her dam was Imp. Jill (Jen), who was a granddaughter of Templeton's #Roy. When she was an older puppy (sometime between seven and 10 months old, I don't recall exactly), I wanted to try her on sheep. I knew she was bred to work, though the thought that I would ever become interested enough in "herding" to pursue it seemed very unlikely at the time. I found a person who would allow me to bring her to his field and see what there was to see. To my surprise, watching Kaylie turn on to the sheep and start using instinct to control them also sparked something in me. I began taking lessons when I could, driving almost four hours round trip. Kaylie after a handful of lessons with me and about a month of in-house training with our instructor. Unfortunately, I don't have many photos of Kaylie on sheep. Kaylie and I were able to take some lessons on and off over the years, but due to life being life and bringing about various major changes, I wasn't able to continue lessons with any consistency. It's always easy for a novice like me to think the dog would have been a great worker "if only" she'd had the right handler, but looking back on it, I still believe that's true. The two offers that I received to buy her, with as little training as she had, reinforce my sense that she had some talent and I'm not entirely blinded by my love for my dog. Regardless of how far we never went as a sheepdogging team, I still owe everything to Kaylie. She is the one who inspired me to "just see" what she could do, and who started it all for me. She was a very special dog. One of the last photos of Kaylie, taken the day before I let her go.